As every father knows, children have a tendency to get a little rambunctious. It starts early in their toddler days when an experiment with running can lead to several giggle-inducing laps around the house. Soon, children are out in the yard digging holes, climbing trees, playing tag, racing bikes down the street and building structurally-questionable forts in the woods. Inevitably, these adventures may result in a broken bone or fracture at some point. While it's something that happens to just about every child, the wails of an injured youngster can send any concerned parent into panic mode. If your little one has never experienced this sort of injury before, the experience will likely be one of the most shocking moments in his or her young life. Short of locking your son or daughter in their bedroom, there's little you can do as a father to foresee and prevent such an injury. Children have a habit of playing rough and exploring areas where they don't belong. However, knowing how to handle this situation and comfort your child when an injury does occur is an important part of being a parent. According ABC News, a recent study by the U.S. Department of Agriculture found that an increasing number of children are at risk of breaking a bone – likely due to lack of calcium in their diets. Approximately 86 percent of teenage girls and 64 percent of teenage boys are considered "calcium deficient," as drinking milk has become secondary to soft drinks, juices and other beverages. With this in mind, it's important to make sure that your children receive an ample amount of calcium and vitamin D from cow's milk and sunlight exposure. 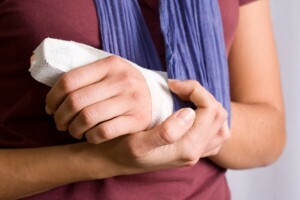 Following an accident, take your child to the family doctor to assess whether it is a break or fracture. If so, your child will likely need to wear a plaster or fiberglass cast for the next several weeks to ensure the bone heals properly.